Overview: Steve Carell and Tina Fey got this film going but were let down by the story towards the end. I’ve seen Tina Fey in Baby Mama, and I’ve seen Steve Carell in Forty Year Old Virgin and really liked both. However, I have also seen Tina Fey’s 30 Rock and Steve Carell’s Evan Almighty and didn’t really enjoy either. So I wasn’t really sure what to think when I saw they were in a film together. But, as it turns out it wasn’t all bad, but it wasn’t all good either. 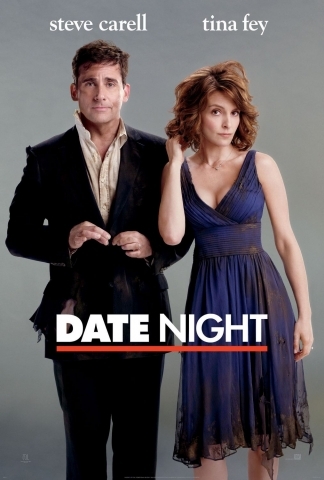 Date Night is about Phil and Claire Foster (Carell and Fey) a ‘boring couple from New Jersey’ who decide to change their weekly date night dinner to a new venue and head for a hip New York restaurant. However, since they didn’t make their own, they take somebody else’s reservation. This leads to them being mistaken for the Triplehorns, a couple who are blackmailing a local criminal. Throw in some appearances from Mark Wahlberg, James Franco, Mila Kunis (Meg’s voice on Family Guy, funny to hear coming out of a real person) and Mark Ruffalo, and let the comedic danger begin. I was actually quite impressed with the beginning plot set up of Date Night as it didn’t seem too far-fetched and the beginning was actually really good. I wasn’t thinking it was going to be, I’m always skeptical when funny people are in films, sometimes it doesn’t come across very well and they just don’t work, (I felt this way about Ricky Gervais in Ghost Town but actually ended up liking it) but once Date Night got started I was pleased. The jokes that Carell and Fey were churning out were hilarious and I was looking forward to the next hour of my life. I was also impressed with the management of a scene when the Fosters are supposed to be in mortal danger, the actors made it funny without being too unrealistic, but also managed to keep the characters looking scared in a humourous way. However, towards the end of the film the jokes just weren’t enough anymore and the plot line began to run thin, and although it was funny when they linked back to jokes from the beginning of the film it got a bit wearing, and also made me wonder if they had started to run out of material. Then everything started to get a little bit too corny for my liking. One good point was that at 88 minutes long the film didn’t drag and the corniness didn’t last too long. Plus, the outtakes played during the credits were worth waiting for. Overall of course Carell and Fey are the shining stars in this movie and without them it would have been really awful. There are several particular moments when their performances really make you laugh, look out for: Tina Fey pretending to be a stripper ‘I don’t really have gum’, Steve Carell’s Mark Wahlberg impression, and both actors pretending to be busy New Yorkers.